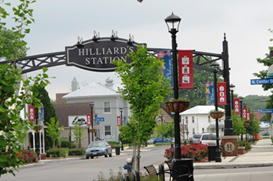 Hilliard is located on the west side of the city, just west of interstate 270 and just north of interstate 70. There is a good mix of residential property and commercial property in Hilliard. There is easy access to shopping and restaurants in Hilliard and in Dublin, which is about a 10 minute drive. The school district is made up of 14 elementary schools, 3 middle schools, 2 sixth grade schools and 3 high schools (Wikipedia). The population of Hilliard is around 28,000 people. The old Hilliard Village consists of small shops and restaurants that provide you with that small town feel even though 5 minutes away is the busy sections of Hilliard and Dublin. Exp Realty is Columbus, OH's most innovative real estate team. © 2019 Columbus Board of Realtors MLS, Inc. All rights reserved. IDX information deemed reliable but not guaranteed. Data last updated 2019-04-23T15:51:27.383.